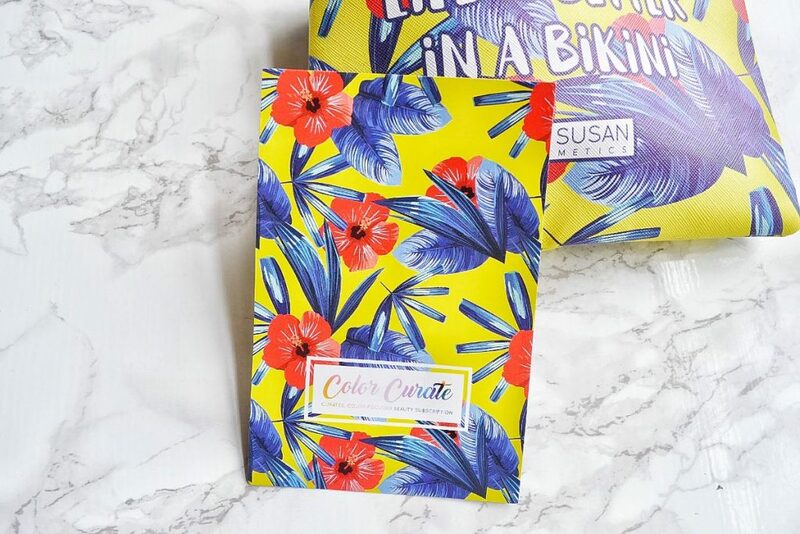 Color Curate is a monthly beauty subscription box that sends out four cruelty free, vegan makeup products each month. 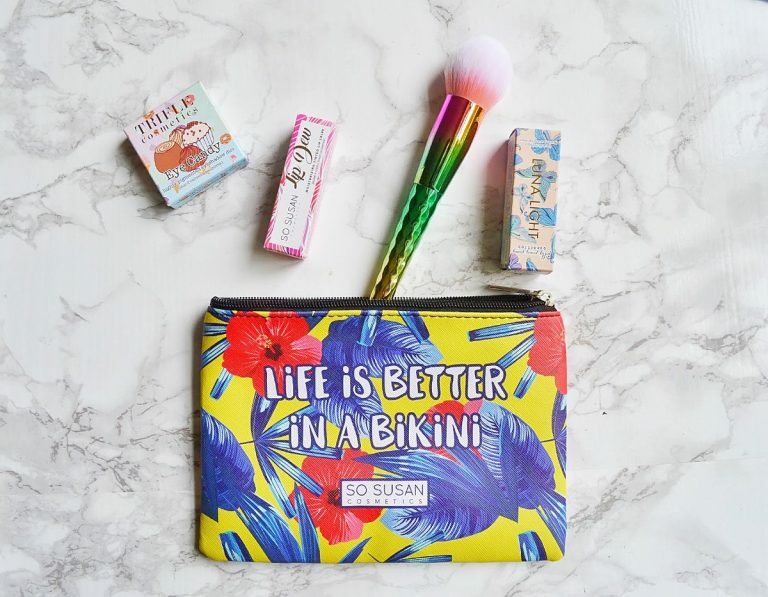 The products are full sized, and contain ingredients that are actually good for your skin! 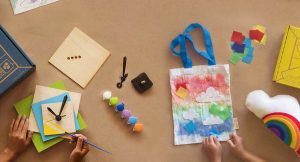 A Color Curate subscription costs $20.95 each month, but the bags are typically quadruple in value! 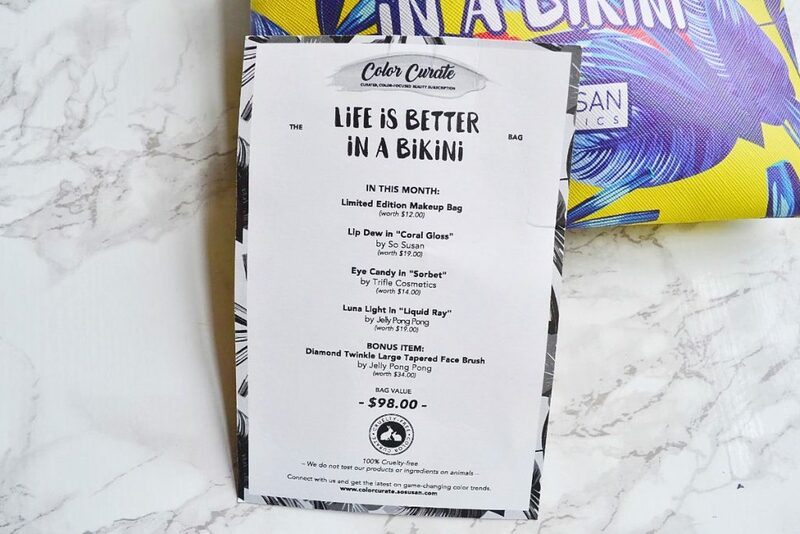 Today, I will be reviewing Color Curate’s August subscription, themed: Life Is Better In A Bikini. 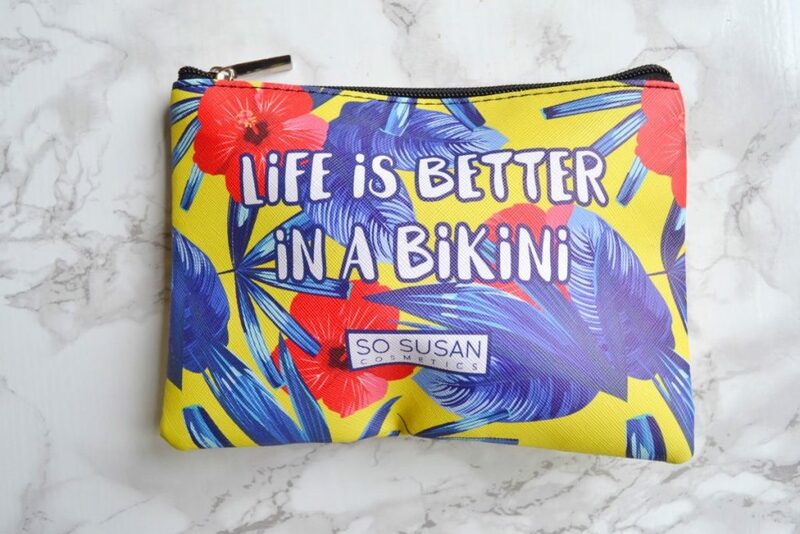 It arrived in a bright yellow makeup bag, covered in a hibiscus flower pattern. I think this is gorgeous and so summery! Inside the bag was a card with information about each product. I love that it gives you the box’s total value! I love receiving eyeshadow in beauty boxes, so I was really excited to see this eyeshadow duo in August’s Color Curate. I received “Sorbet”, which has a wine shade and an eggplant shade. They have a gorgeous lustrous finish, and feel very creamy to the touch. 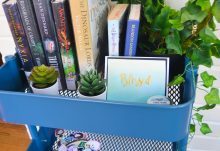 They blend like a dream, and I especially like using the eggplant shade as a topper. I find that they apply best with my finger, rather than a brush. 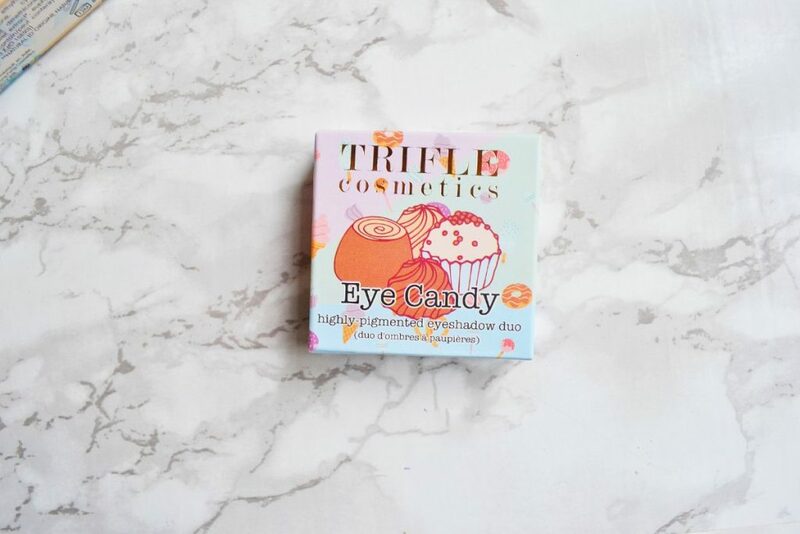 I love the Trifle Cosmetics packaging! 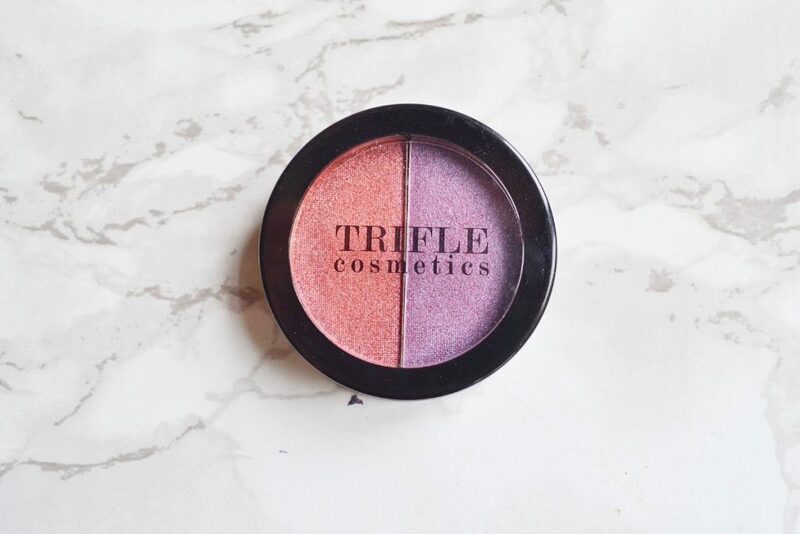 Last month’s box had a Trifle Cosmetics blush and highlight duo, and it was just as cute. 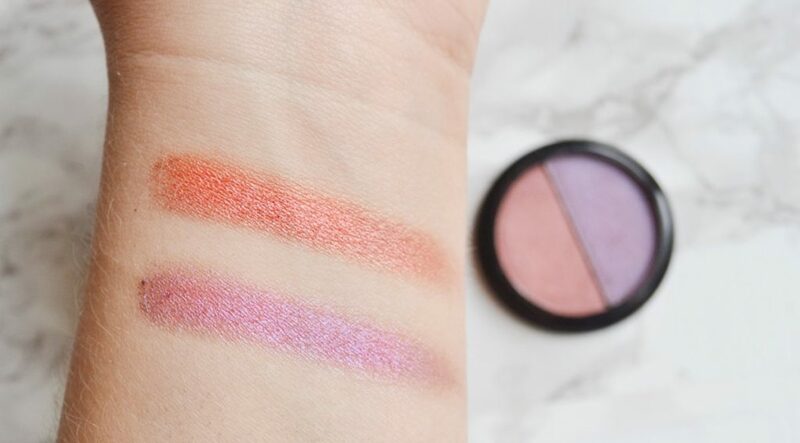 Look at how gorgeous these swatches are! 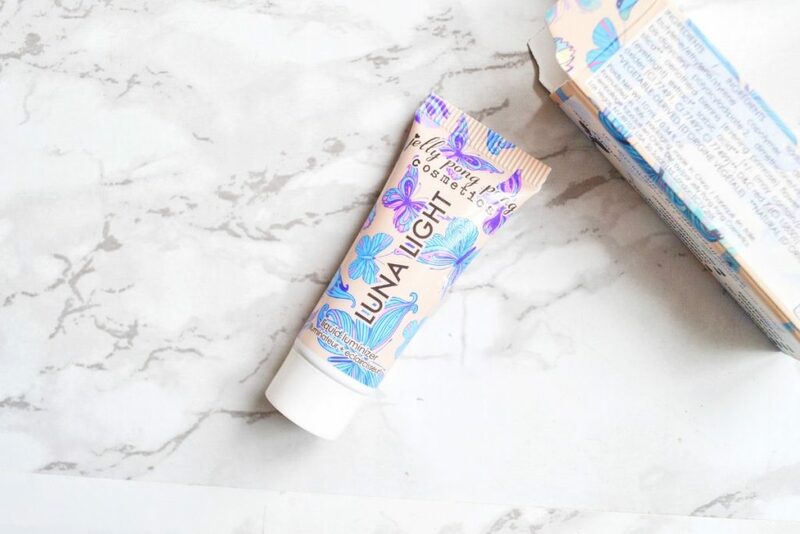 Luna Light is a liquid luminizer that uses pearlescent pigments to create an iridescent shine. This is one of the most intensely pigmented highlighters I’ve ever used! The photos don’t even do it justice. 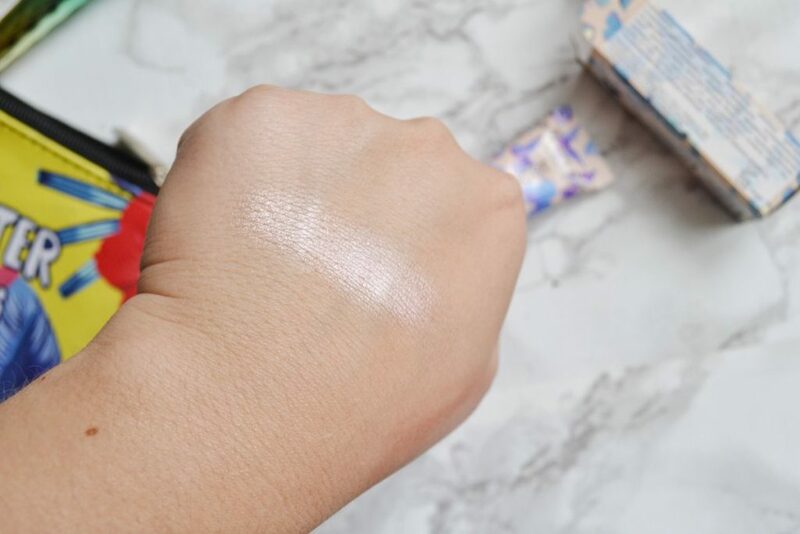 It catches the light beautifully, and it blends seamlessly with your skin. Even though it is intense, it doesn’t look like you’ve caked product on your skin. It gives you a gorgeous, lit-from-within radiance. 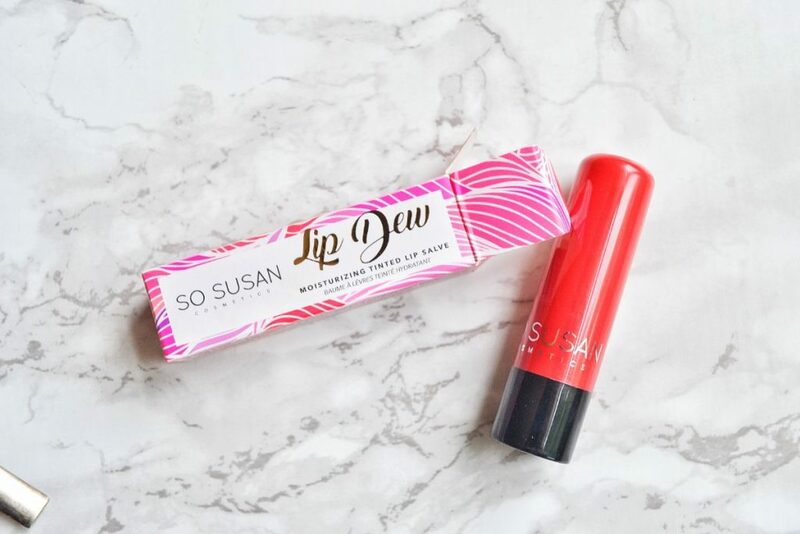 Lip Dew is a tinted moisturizing lip salve that is powered by pure shea butter to create a protective, vitamin rich barrier against daily pollutants. 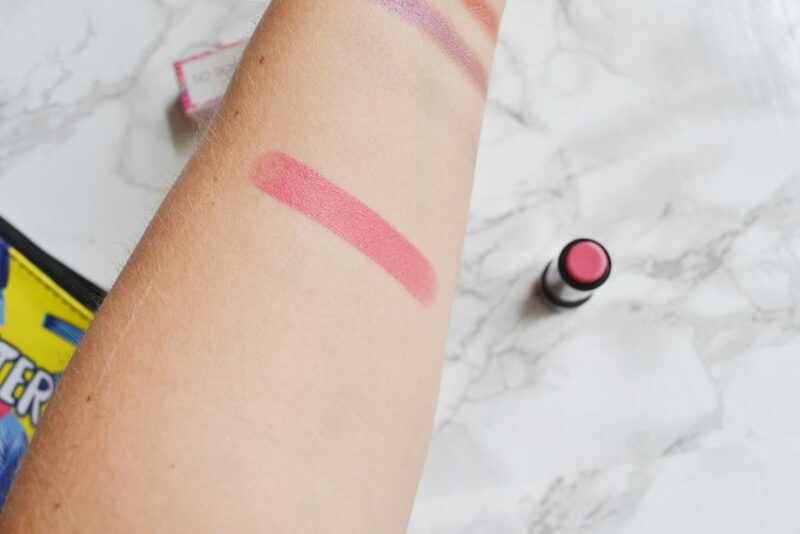 It is silky and creamy, and feels so hydrating on your lips! I love that it actually has decent pigmentation, unlike other salves I’ve tried. I received “Coral Gloss”, but it’s more of a dusty rose color. I squealed when I pulled this face brush out of my bag! 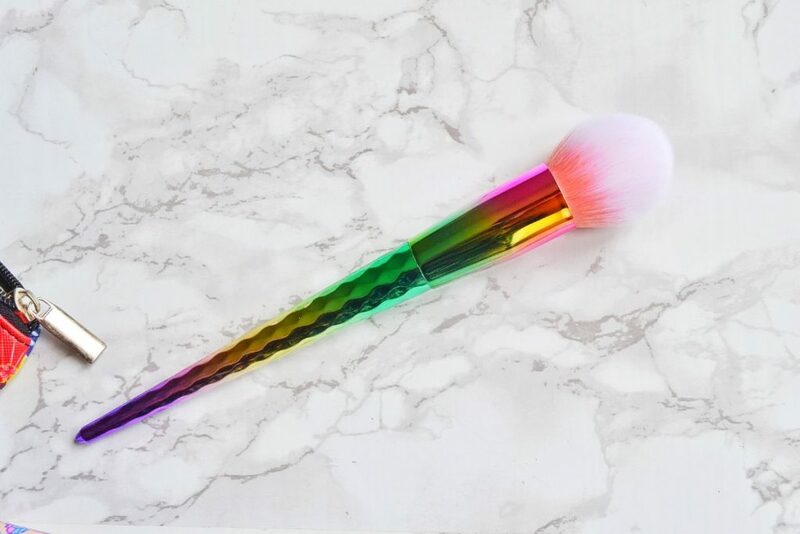 I have wanted one of these brushes for so long; it manages to remind me of mermaids and unicorns simultaneously. The brush heads are vegan and anti-microbial, as well as super soft and plush. This feels amazing on my face, and looks great on my vanity. 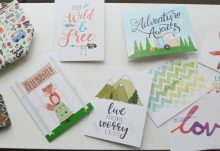 I am incredibly pleased with Color Curate’s August box; even more so than last month! 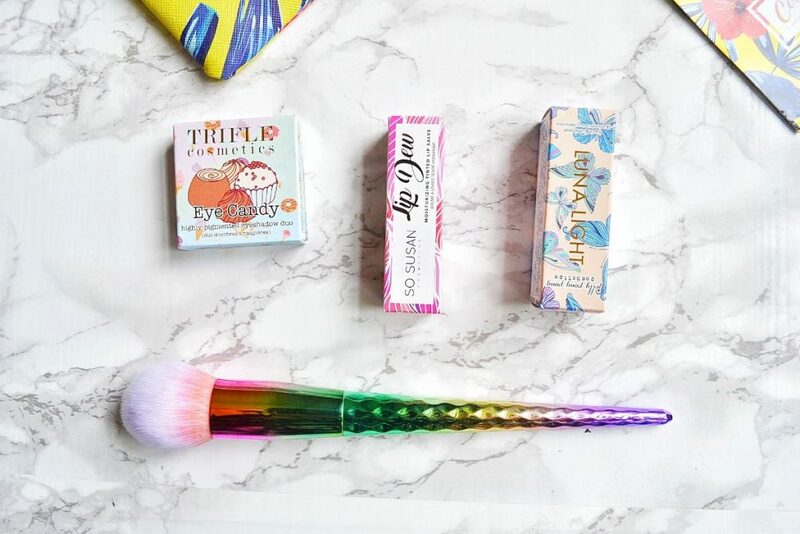 I love every single item; especially the face brush and the Luna Love highlighter. The bag was worth $97, which is an incredible value! And, I love that every item is vegan, and good for my skin. I am beyond impressed by this month's selection of products! And $97 worth of makeup for $20 subscription is pretty stellar!